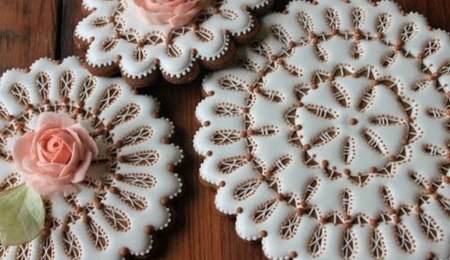 This video tutorial shows a clever way to create a royal icing spiderweb on a sugar cookie in a few quick and easy steps. Learn how to make a spider web on a sugar cookie using royal icing. I would like to know how she made the perfect square of icing without it running over edge anywhere! !very cute!! How do you pipe such straight lines? Everytime I try to pipe anything, whether it be melted chocolate, royal icing or butter cream, it always pipes out squigly or zig-zaggy. Any advise would be most appreciated. Thanks. Ann Marie, I see that I am late to the party on this one but hope this helps! A lot of things can affect your end result. The easiest one to control is the tip. Make sure you keep a damp cloth or sponge close by to periodically clean the tip. Dried bits on the end will cause an uneven line. When working with royal icing, make sure that you don't scrape down the sides of your bowl and incorporate the dried bits into your icing. This will also plug the opening. The last tip is to use a finger on your free hand to act as a stabilizer. It is surprising how much that helps toward creating a straight line! Happy baking! Pipe a frame or a dam first to define the edge of your iced area and contain your royal icing. 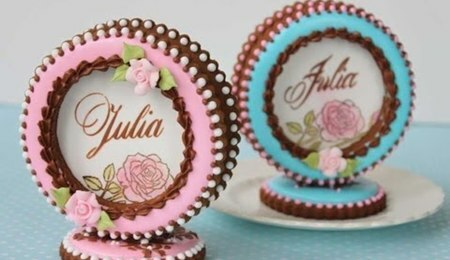 Using a slightly thicker royal, pipe the outer most border of the design, let it dry slightly, then flood the center to fill with your usual royal. For the square, you can use a straight edge to guide your tip.